I beat the other bidder by only .50 cents - I bet the guy was bummed. I waited until about a minute was left and put in a bid of up to $30.00. Apparently the other bidder only bid the listed starting bid of $24.00. Anyway, it's a sort of tactic I've used to good effect on ebay in the past. Note the extended grip for use with the other hand. I saw a video showing the secondary hand should only hold the pommel area, and not with a tight two-handed grip. This makes for more articulated movement. The sword is fairly light and well balanced. The edge is semi-sharp; that is, not razor sharp, and only from the middle of the blade to the tip. As I intend to use it as a practice/training sword, I don't want it sharp anyway. I may file the edge down a bit to make it blunt - that is if some hedge trimming doesn't dull it first. Anyway, it's a fine addition for the price of about two or three decent lunches. To compensate I ate off the dollar menu most of last week. 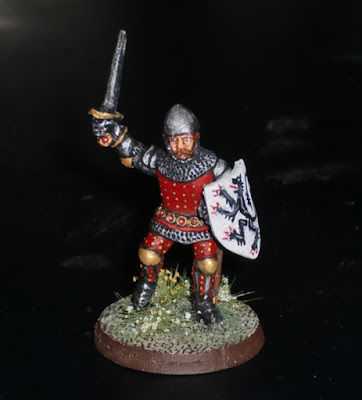 Here is a Black Tree Design 2nd Crusades figure painted up as the Anglo-Norman Warlord John de Courcy. He was quite a reputable warrior who conquered much of Ireland in the latter part of the 12th Century. The De Courcy arms are three red (gules) eagles on a white (argent) field. His helmet is the Phrygian Cap style popular at the time, after the 1st and 2nd Crusades. De Courcy's actions in Ireland were not sanctioned by King Henry II, who declared De Courcy a traitor. Later, Henry's successor, King John ordered Hugh de Lacy to arrest him. De Courcy was famed for his martial prowess and his capture by Sir Hugh was as much by guile as feat of arms. "Sir Hugh de Lacy was commanded to do what he might to apprehend and take Sir John de Courcy, and so devised and conferred with certain of Sir John's own men, how this might be done; and they said it were not possible to take him, since he lived ever in his armour, unless it were a Good Friday and they told that his custom was that on that day he would wear no shield, harness nor weapon, but would be in the church, kneeling at his prayers, after he had gone about the church five times bare-footed. And so they came at him upon the sudden, and he had no shift to make but with the cross pole, and defended him until it was broken and slew thirteen of them before he was taken. His armor is not much different from those worn at the Battle of Hastings about a hundred years earlier. The wearing of surcoats still not common, and the shield still fairly large. Mail was more fully worn over most of the limbs. De Courcy was imprisoned after his capture, and later released upon his oath of going on pilgrimage in the Holy Land. The padding added under the camail; only the area where the padding meets the mail opening at the chin was stitched. The cuffs of the leather gloves have been folded inside the gauntlet cuff - it adds to the padding of that area. 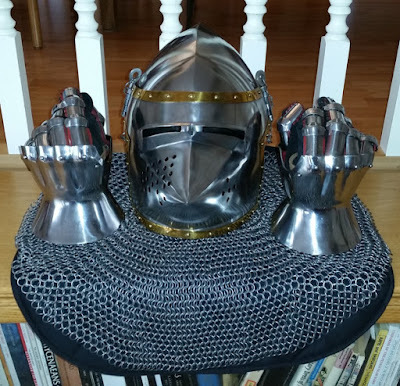 Thanks to Paul F. Walker, who's marvelous site on Medieval armor, Armour Illustrations, I lately stumbled upon in my quest to keep my visor in the raised position when not needing to be down, I was able to do just that. 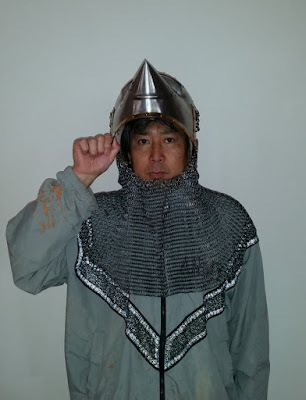 Paul, as some of you may already have known is a subject matter expert on Medieval armor. 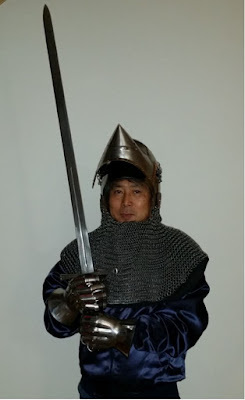 He not only lectures on the subject, but has also written a book on it called History of Armour 1100-1700. He's a fine illustrator too. Anyway, Paul kindly answered my post on his blog asking about the visor issue. He immediately responded with what turned out to be a deceptively simple process. He advised me to remove the pins holding the visor, and replace them with nuts and bolts tightened enough to allow the visor to remain and still able to be pushed down. Luckily I already had a Dremel and a metal cutting attachment. This worked perfectly and only needed a little help of a Phillips headed screw driver and hammer to pop out. 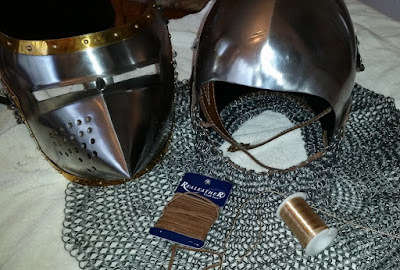 WIP shot with the white arrow inside the bascinet showing where the flattened end of the pin was sheared off; the black arrow points to the remainder of the pin popped out of the bascinet. I may enlarge the holes of the visor and hinges and replace the smaller bolts with larger diameter ones, as the smaller ones have trouble holding up the weight of the visor, but here it is held precariously up. That's my mom's satin Las Vegas windbreaker she got a while back as a prize; it's a stand-in for a padded gambeson. The camail fits really good now with the padded liner added - the padding sits snugly at the chin and the mail spreads out over the shoulders cleanly. 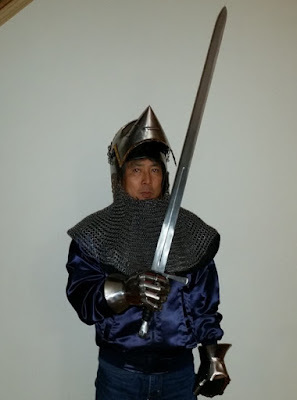 in China and would likely break in combat, but it'll be good for swinging around the backyard. I'll probably grind off the sharpened edge to make it safer too; after I cut some branches off trees. Okay, so here are the last six Black Tree Design foot knights that I've had sitting around for a while. They are painted up from left to right (front row): Owain Glyndwyr, Laurence Hastings - Earl of Pembroke, Sir Miles Stapleton; left to right (rear row): Sir Richard Fitzsimon, Sir John Beauchamp, and Sir Roger de Clifford. 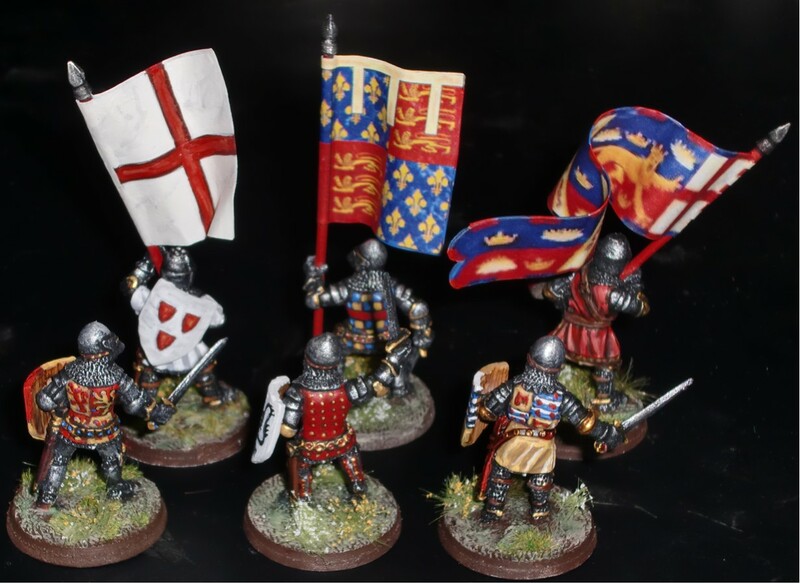 Sir Richard carries the Cross of St. George; Sir John the Royal Standard of Edward III; and Sir Roger the banner of the Black Prince. 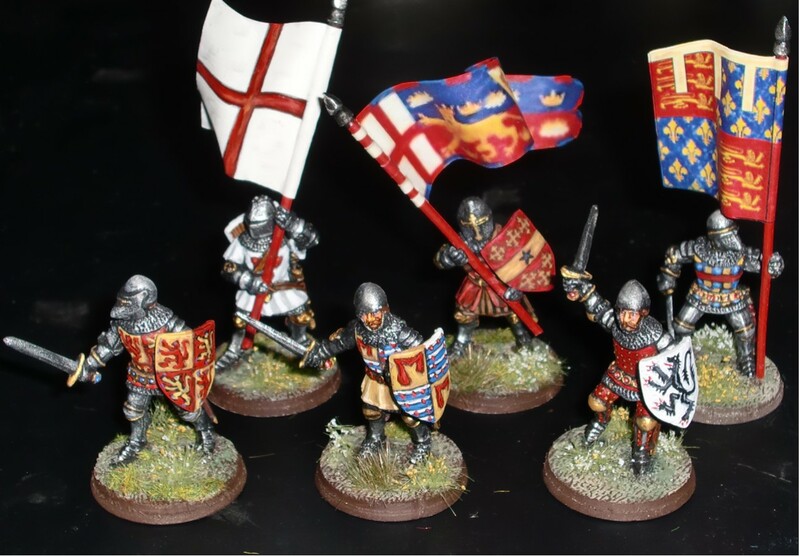 The last two were downloaded from the Danish Figure Games Association site, and the St. George Cross was hand painted. They are based on Gale Force 9 magnetic 25mm rounds. As I've mentioned before, I find this range from BTD to be particularly nice. Very nicely detailed, and historically accurate, IMO. Here's the last Black Tree Design foot knight from their Early-HYW command pack - painted up as Sir Richard Fitzsimon. Sir Richard is credited with protecting the young Prince of Wales at Crecy when under attack by the Duke of Alencon's forces. This is the narrative by Froissart: Sir Richard Fitzsimon, the Black Prince’s standard bearer was beside the Prince when he fell and threw the standard down to cover him and then stood on it to both protect him and prevent the standard from being carried off. Sir Richard Fitzsimon then slew the French knight who had knocked over the Black Prince, then killed the Count of Flanders. The Frenchmen eagerly pushed forward to seize a valuable prisoner and the Englishmen were struck down in turn until Fitzsimon was the only one left standing. He bears the Cross of St. George. Sir Richard was another founding member of the Order of the Garter - no surprise considering his prowess at Crecy. His arms are three red (gules) shields (escutcheons) on a white (argent) field. Quite simple, yet probably visually stunning on the battlefield. 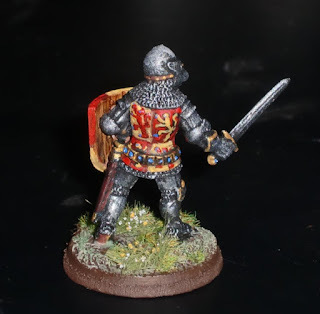 Here is another Black Tree Design HYW knight from their command pack. He is painted up as Sir John Beauchamp, who was the younger brother of Thomas, Earl of Warwick. Sir John was Edward III's Royal Standard bearer at Crecy. He was also present at the Battle of Sluys, and the Siege of Calais. Sir John was one of the founding members of the Knights Garter. The lovely standard was another free download from the excellent Danish Figure Games Association site; the flags themselves created by one Rune Kramer - quite a talented and resourceful bloke. His shield bears the Beauchamp coat of arms with a black (sable) star in the center field to indicate his status as a younger brother of the family head. One more figure remains from the command pack, and he is planned to bear the St. George's Cross flag. Getting back to brushwork - here is another Black Tree Design HYW foot knight. 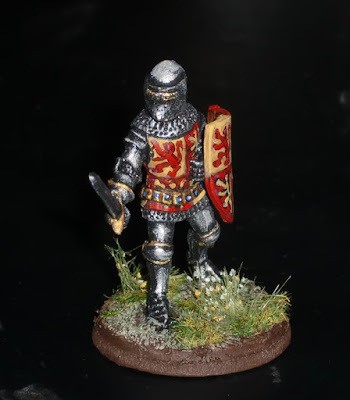 He is painted up as Sir Laurence Hastings who served under Edward III in Flanders and Scotland. He also participated in the Duke of Lancaster's campaign in Aquitaine and Gascony in 1345. He was at the Siege of Calais in 1346. He died in 1348 at the age of 29. His coat of arms are those of Hastings and Valence quartered. The arms of Hastings being a woman's sleeve and that of Valence being bars argent (white) and azure (blue) with red (gules) martlets. Quite a catchy set of arms. 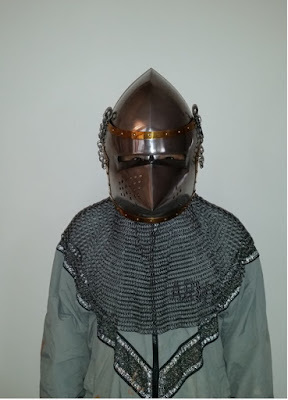 His armor is typical of the early 14th century consisting of plate limb armor supplementing mail. He wears an open faced bascinet with mail aventail. 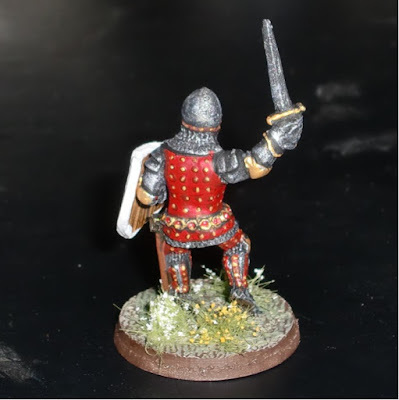 Black Tree Design makes some of best figures for the period - Crecy to Poitiers - in my opinion. The figures are on the larger side of 28mm, which makes a nice foil for heraldry. As I am off on Fridays, I was fortunate to be at home when the door bell rang not once, but twice this morning - first from FedEx and not long afterwards from the USPS. The first package was a padded hood, and the other Hourglass Gauntlets. Both were picked up off of ebay a couple of weeks ago. I was about to start on the three remaining Black Tree Design HYW foot knights, but had to try out both armor items. Here is the padded aventail sitting under the mail which fits perfectly once I did some modifications to it. I still need to sew the front upper portion onto the chin opening of the mail. The padded coif was cut off and then the caped portion was reversed as the mail hangs lower at the front, and the padded hood was shorter at the front. Anyway, the image below shows how it now fits. Here's the coif cut away from the cape portion. Straps were also cut off as they weren't needed. 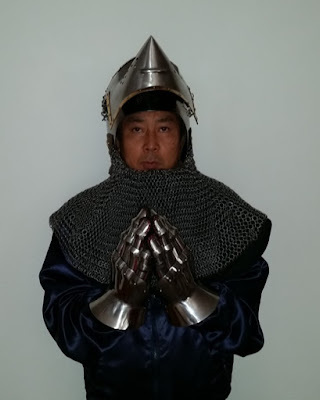 The padded coif can now be used with a Sugarloaf helm I also have. And here are the hourglass gauntlets. There are also made in India and retailed from a supplier in Georgia. I tried them on and the fingers and thumb are well articulated for movement. 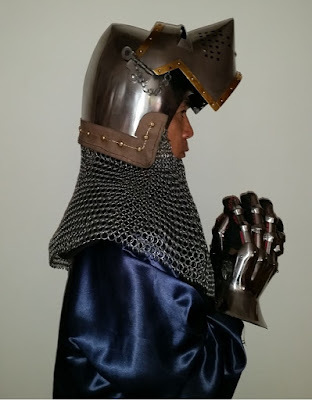 The leather gloves are attached to the gauntlets. They feel great and make a nice metal thud when punched together. They are made similar to the ones the Black Prince had, with the inside of the cuff open. I was able to press down on them to make the width a little smaller. I don't know where I'm going with all of this, but so far all of these reproduction pieces have exceeded my expectations of quality and fit - not to mention the relatively inexpensive costs. Who knows, the Feds may start imposing some higher import taxes someday, so better get them now. Another diecast ebay purchase - couldn't resist the low "buy it now" (sucker) price and shipping. 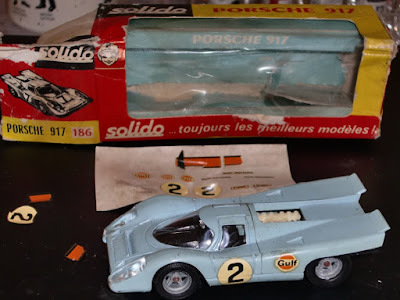 So, this 906 series is the second of the so-called plastic Porsches of the late1960's. It was the first to use a tubular frame, versus the boxed steel frame of its predecessor, the 904. Posed next to one of those 28mm fashion models. Speed sells. In its first race at Daytona in 1966, it won its class against the Ferrari Dino 206. Again, next to an obligatory 28mm fashion model. Below it's placed chronologically next to its brethren. All "street legal" racers. It came boxed in a nice display case too. There's only one more racing Porsche I'd like to get, the 956/962; preferably in Rothmans colors. 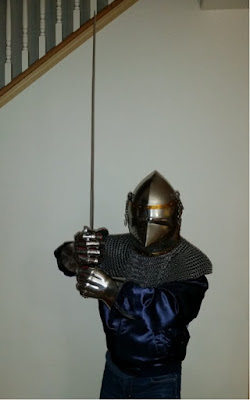 Here is another Black Tree Design HYW knight in late-14th C. armor. He's painted up as Sir Roger de Clifford who had long and successful careers in both politics and the military. He saw extensive service in France and Scotland. Here he is bearing the standard of the Black Prince. There is no evidence that Sir Clifford actually carried these colors at Poitiers or elsewhere, but I liked the combination of his arms and the prince's standard. The standard was downloaded from the excellent Danish Figure Games Association website. This is the last of the late-HYW figures from Black Tree Design. There are three more figures from their early-HYW range to be painted. 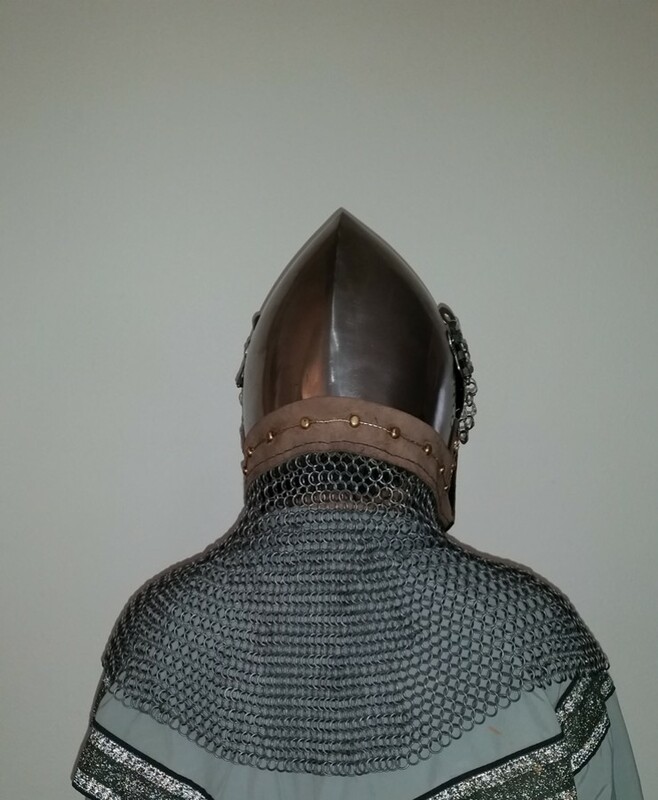 Oops - I see that I forgot to paint the leather strap and vervelles that hold the aventail to the bascinet. Another ebay score arrived today. I was pleasantly surprised that no one else bid on it - low price and free shipping. 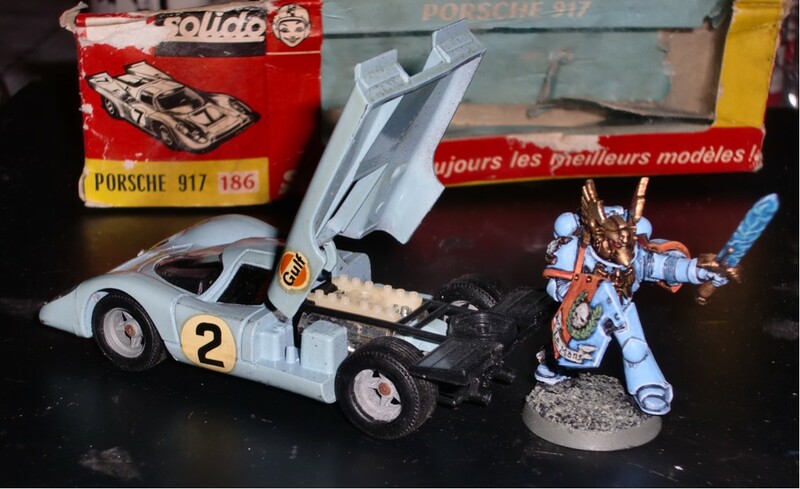 Maybe the images put people off as it was in the original packaging and appeared to sit in a garage for decades. Anyway, the car itself is in great shape, but the decals have dried up and even flaked off the sheet. The wheels roll, but may need some oiling, as the axles have rusted a bit. 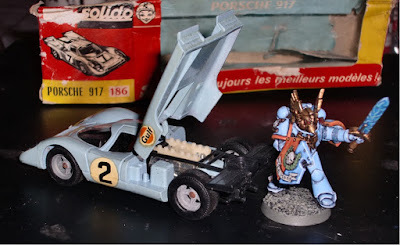 This is the famed and potent 917 powered by a flat-12 cylinder engine. Its top speed at Le Mans in the early 70's was 224 mph - pretty impressive even now. Actually that's deadly fast. This is the same type of car used in the movie Le Mans starring Steve McQueen. The rear engine lid lifts up, exposing the engine. A Space Marine from McQueen's Marauders next to it for scale. He may have to jump start it with his light saber, as the engine hasn't been run for decades. Hopefully the decals will still be usable too. Here it is next to some of its predecessors - a 500 Spyder and 904. Gentlemen, and Space Marines, start your engines. Here is another Black Tree Design HYW foot knight - this time painted up as Sir Miles Stapleton of Bedale. He was a founding member of the Order of the Garter. He was present at the Seige of Tournai in 1340, following the Battle of Sluys. He fought in the War of Breton Succession and was gravely wounded at the Battle of Auray in 1364. Sir Miles' armor is of the interesting type with studs on his brigandine as well as his cuisses. His lower leg armor being splinted and studded. 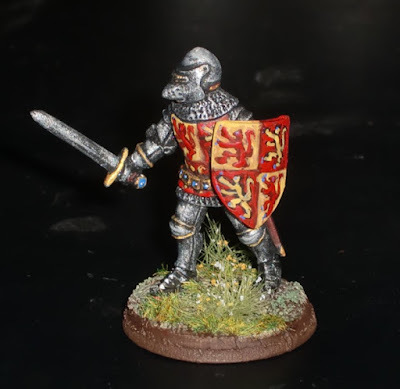 His arms are argent, a lion rampant sable. Sir Miles died in December 1364 succumbing to wounds suffered at the Battle of Auray. 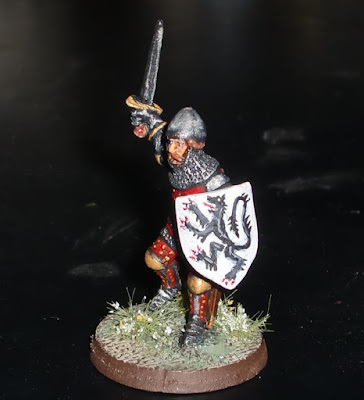 Finally painted one of the Black Tree Design HYW foot knights picked up from a sale a long while back. He's wearing late 14th/early 15th C. style armor. Mostly plate with only vestiges of mail remaining. His arms are those of the last Welsh Prince of Wales - Owain Glyndwr. He's a bit of a mythical character who appeared on the scene as quite an important figure during the reign of Richard II of England. He served in Richard's army in Scotland, but later led a rebellion against Richard's successor, Henry IV. Henry Hotspur joined him at the ill-fated Battle of Shrewsbury. Soon after this, Glyndwr's popularity waned and he seems to have disappeared from history, and is believed to have died around 1416. In Henry IV, Shakespeare says of him being "not in the roll of common men and a worthy gentleman, exceedingly well read, and profited in strange concealments; valiant as a lion, and wondrous affable; and as bountiful as mines of India." Stopped by Joann's this morning and picked up some brass wire and leather lace. The wire was braided using an electric drill and then routed through the vervelles. It wasn't too difficult, but a little slow as the wire had to be pushed and pulled through each successive hole. The ends were wrapped around the last vervelles on each side of the helmet. The leather lace was used to tighten up the mail at the chin. It now sits very nicely as seen on period artwork and effigies. The only thing I plan to add is a padded liner under the camail. This should keep the mail from getting bunched up, and also keep whatever is worn underneath clean as the mail can get things a bit grimy. I'd like to fashion something to keep the visor up. Hmm, is guess there may be something to the theory that the hand salute originated from lifting the visor - or possibly the power sign. The brass fittings and wire really enhance the look of the helmet. 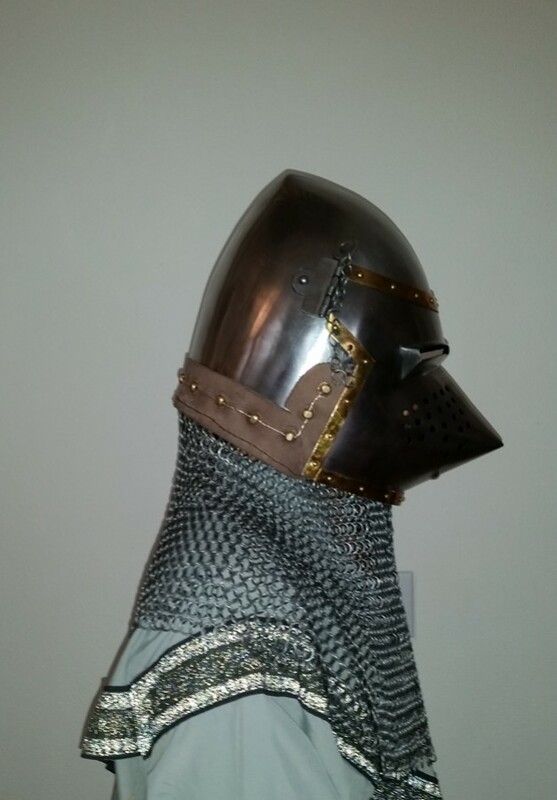 The visor now seats fully closed after slightly pushing the bottom edges of the bascinet in. "Hello, is there anybody in there?"